Mantras are most powerful tools to the common persons to fulfill their desires. The word “Mantra” has been derived from Sanskrit. Mantra contains two words – “man” which means “to think” and suffix “tra” means “tool”, hence a literal meaning would be “instrument of thought”. A Mantra is a hymn used for worshipping a God or Goddess to attain desired results and overcome difficulties and problems. Mantras are energy-based sounds. Mantra is a religious or mystical syllable or poem, typically from the Sanskrit language. 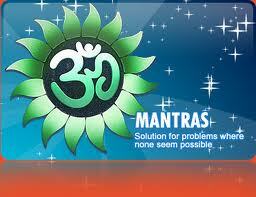 Mantras are also integrated in religious rituals to remove obstacles, avoid danger, reduce foes, or accumulate wealth. Mantra is symbolized as a requisite for spiritual advancement and high attainment. Verses (Sloka) from holy Hindu texts like the Vedas, Upanishads, Bhagavad-Gita, Mahabharata, Ramayana, Durga Saptashati are considered powerful enough to be repeated to great effect, and therefore have attained the status of a Mantra. Scientifically, it is said that Mantras are compositions of powerful sounds which create effective vibrations for mental, physical and spiritual healing. For that reason, it is always the best to chant or recite the Mantra by yourself. It is important to pronounce the mantra properly with an understanding of its meaning. Improper pronunciation of Mantra can inflict losses. So, one should be careful while chanting. Mantras have great power in them that sometimes work in an unbelievable strong way. A Mantra, when repeated constantly during meditation, first loudly and then through silent and mental chanting, changes the consciousness. One’s subconscious mind can find its solution through meditation and recitation of Mantras.